This week's episode of SmackDown Live posted the show's lowest viewership of 2018, Raw failed to rebound in viewers without NBA competition, while Total Bellas saw a major jump with an increase of 30% in viewers, and a look at the UFC Fight Night numbers from Utica, New York. 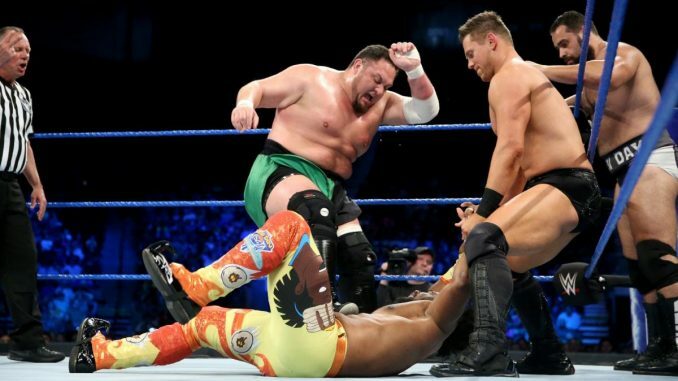 Tuesday’s episode of SmackDown Live was one of the least viewed episodes of the series since the brand split in July 2016. Tuesday’s show saw an average of 2,138,000 viewers watching on the USA Network, which was surprisingly low given the lack of sports competition as the NBA and NHL playoffs had the night off. The show was promoted around a contract signing between AJ Styles and Shinsuke Nakamura and Carmella revealing “an untold truth” about Asuka that went nowhere. It was the fifth lowest viewership average since the brand split in the summer of 2016. This other four episodes since July 2016 to perform lower were from October 25th, 2016 (against Game 1 of the World Series, November 8th, 2016 (the night of the U.S. Election), an episode from June 7th, 2017, and on Halloween night last October, which also featured competition from the World Series. Monday’s episode of Raw averaged 2,520,000 viewers on the USA Network, up 1.3% from the week prior. The difference from last week is that May 28th episode of Raw went against the NBA and NHL playoffs while this week only faced competition from the Stanley Cup Final, which did 5,061,000 viewers. Raw began with 2,594,000 viewers watching on average in the first hour and remained almost identical with 2,593,000 viewers for the second hour. The third-hour drop saw an 8% drop down to 2,390,000 and concluded with the Kevin Owens vs. Finn Balor match in the main event slot. WWE did receive some positive viewership news with Total Bellas rebounding in a major way with a 30% increase for Episode 3 of the current season. After posting all-time series’ lows of 517,000 and 505,000 viewers for the first two episodes, this week’s episode jumped to an average of 654,000 viewers on E! The jump in viewership was impressive given that Game 2 of the NBA Finals took place that night. The UFC ran a Friday night card last weekend from Utica, New York and was headlined by a 33 second knockout by Marlon Moraes over Jimmie Rivera. The main attracted 510,000 viewers on FS 1. There were 322,000 viewers for the preliminary card on FS 1, which started late at 8:23 pm on Friday.